I spent the last couple of weeks writing sample code for ASP.NET 5/MVC 6 and I was surprised by the depth of the changes in the current beta release of ASP.NET 5. ASP.NET 5 is the most significant new release of ASP.NET in the history of the ASP.NET framework — it has been rewritten from the ground up. In this blog post, I list what I consider to be the top 10 most significant changes in ASP.NET 5. This is a highly opinionated list. If other changes strike you as more significant, please describe the change in a comment. For the first time in the history of ASP.NET, you can run ASP.NET 5 applications on OSX and Linux. Let me repeat this. ASP.NET 5 apps can run on Windows, OSX, and Linux. This fact opens up ASP.NET to a whole new audience of developers and designers. 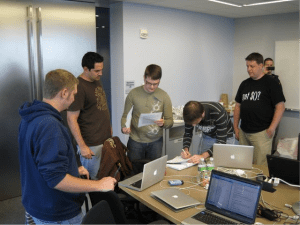 The traditional audience for ASP.NET is professional developers working in a corporation. Corporate customers are welded to their Windows machines. Startups, in stark contrast, tend to use OSX/Linux. Whenever I attend a startup conference, the only machines that I see in the audience are Macbook Pros. These people are not the traditional users of ASP.NET. Furthermore, designers and front-end developers – at least when they are outside the corporate prison – also tend to use Macbook Pros. Whenever I attend a jQuery conference, I see Macbook Pros everywhere (the following picture is from the jQuery blog). Enabling ASP.NET 5 to run on Windows, OSX, and Linux changes everything. For the first time, all developers and designers can start building apps with ASP.NET 5. And, they can use their favorite development environments such as Sublime Text and WebStorm when working with ASP.NET apps (No Visual Studio required). I love ASP.NET Web Forms. I’ve spent hundreds – if not thousands – of hours of my life building Web Forms applications. However, it is finally time to say goodbye. ASP.NET Web Forms is not part of ASP.NET 5. You can continue to build Web Forms apps in Visual Studio 2015 by targeting the .NET 4.6 framework. However, Web Forms apps cannot take advantage of any of the cool new features of ASP.NET 5 described in this list. If you don’t want to be left behind as history marches forward then it is finally time for you to rewrite your Web Forms app into ASP.NET MVC. It is also time to say goodbye to Visual Basic. ASP.NET 5 only supports C# and Visual Basic is left behind. Tag Helpers is the one feature that might have the biggest impact on the way that you create your views in an ASP.NET MVC application. Tag Helpers are a better alternative to using traditional MVC helpers. In the view above, the Html.BeginForm(), Html.LabelFor(), and Html.TextBoxFor() helpers are used to create the form. These helpers would not be familiar to an HTML designer. Notice that this new version of the form contains only (what looks like) HTML elements. For example, the form contains an INPUT element instead of an Html.TextBoxFor() helper. A front-end designer would be fine with this page. The only thing special about this view is the special asp-for attributes. 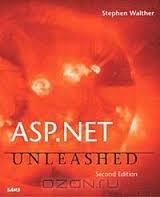 These attributes are used to extend the elements with server-side ASP.NET MVC functionality. Goodbye subcontrollers and hello View Components! In previous versions of ASP.NET MVC, you used the Html.Action() helper to invoke a subcontroller. For example, imagine that you want to display banner ads in multiple views. In that case, you would create a subcontroller that contained the logic for returning a particular banner advertisement and call the subcontroller by invoking Html.Action() from a view. Subcontrollers – the Html.Action() helper — are not included in the current beta of MVC 6. Instead, MVC 6 includes an alternative technology called View Components. If the time is before 5:00pm then the View Component returns a partial named _Advertisement with the advertisement text “Buy more coffee!”. If the time is after 5:00pm then the text changes to “Buy more warm milk!”. View Components are very similar to subcontrollers. However, subcontrollers were always a little odd. They were pretending to be controller actions but they were not really controller actions. View Components just seem more natural. Front-end development gets a lot of love in ASP.NET 5 through its support for GruntJS (and eventually Gulp). AngularJS is one of the most popular client-side frameworks for building Single Page Applications (SPAs). 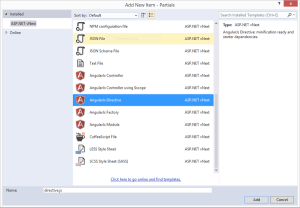 Visual Studio 2015 includes templates for creating AngularJS modules, controllers, directives, and factories. 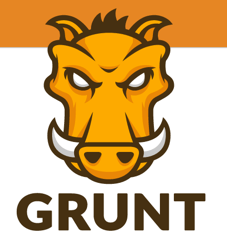 The support in ASP.NET 5 for GruntJS makes ASP.NET an excellent server-side framework for building client-side AngularJS apps. You can combine and minify all of your AngularJS files automatically whenever you perform a build. You can interact with an MVC 6 controller from an AngularJS $resource using REST. In the code above, the IRepository interface is passed to the constructor for the ProductsController. The built-in ASP.NET Dependency Injection framework passes EFRepository to the ProductsController because IRepository was bound to EFRepository. Goodbye Visual Studio Unit Testing Framework and hello xUnit.net!